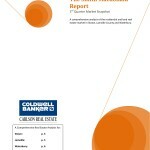 It is our pleasure to inform you that Smith Macdonald Group of Coldwell Banker Carlson Real Estate has released its 2011 3rd Quarter Report, our survey of residential real estate sales in Stowe, Lamoille County and Waterbury. This report compares data based on deals that closed by the end of Q3 2011 (January 1 through September 30) with those closed in the prior quarter and in the 1st three quarters of 2010. The momentum generated by the Stowe area real estate market last year and in the first two quarters has continued. Market-wide, sales transactions increased 23% versus a year ago. This represents a 121% increase in sales volume in Q3 from Q3 in 2009, which represented the bottom of the market. The Smith Macdonald Group ranks number one in all Lamoille County residential sales transactions during the first three quarters of 2011 and top ten statewide year to date. Additionally, Coldwell Banker Carlson Real Estate represented 31% of all sales in markets reviewed in this report more than any one office location. Looking forward to speaking with you soon and we hope you had a nice summer.